Big Band Night - confirmed timings of 3:30 - 6:00 - please sign up in school office from Monday 23rd November. Your generous Harvest donations were given to the Women's Refuge in Swindon and the cash donations of £30.50 were given to Swindon Foodbank. The Children in Need day raised £133.40 and this has been sent in to support the many charities that Children in Need ensure provide help to those in need. Our next charity event is the Christmas Jumper Day on Friday 18th December. A reminder that applications for Reception places for 2016 are now open - if your child is in our Nursery class you will still need to apply as normal for a Reception place. We are already receiving applications for Nursery places for September 2016 and forms are available if you would like to apply for a place. Hopefully we won't need to close for any reason, snow or otherwise, but it would seem sensible to let you know where you can find out what we will be doing should the weather turn snowy. If at all possible, in terms of safety, we will open so that those of you who work can still get to work. The teaching staff live at various long distances from school so their ability to get in to Swindon will have a major impact on whether we open or not. A decision on opening or not will be made by 6:30 a.m. on the day of any snow difficulty. Regardless of what happens after that time, the school will open or close for the whole of that day - so if, for example, the decision is to open and then the snow gets worse we will stay open until 3:30, though you would be welcome to collect your child early if you were worried about travelling in the snow; on the other hand, if the decision was to close for the day, we would remain closed for the whole of that day even if the snow all suddenly melts and the roads clear. We will put a message on the website via blog; will send out a text and will send out an email. The Friends Of Tadpole Farm facebook page will also be updated. If your child mislays an item of clothing in school could we ask, in the first instance, that you mention it to the teachers, who will help your child look for it, and check whether it has been handed in to the lost property box which is now in the School Office. This usually results in items being found. We are running short of spare clothes - if your child has come home in school spares could we ask that you return them, washed, within a couple of days. If you have any spare school uniform that your child has outgrown we would be grateful for donations. Thank you for your understanding whilst we have been unable to use the rear of the school due to the instability of the sheets on the canopy roof. The building contractors are involved on a daily basis and we would like to reassure you that the children have not been playing in that area - their safety and the safety of the staff and yourselves is obviously a high priority for me. Until we have seen that remedial work is effective we will continue to use the entrances at the front of school. Another appeal for coats to be in every day please - the children are in and out in all weathers so need warm coats. Also could any children with long hair please have their hair tied back each day as this helps with health and safety. A reminder that we have a no nut policy in school - this includes peanut butter and nutella/nut chocolate spread. Young children may not yet have had nut allergy identified and this just protects them all. Road safety week, next week, will see the children learning about keeping safe when out and about; the usefulness of high visibility waistcoats, which have been provided for each child by Crest Nicholson and will be sent home with your child next week and then can be used for the journey to and from school; some classes will have safety talks from the police and road safety will be part of each classes learning next week. Competition Time: As part of road safety week we have been asked by the developers to invite the children to create road safety posters asking people to drive carefully near the school and through Tadpole Garden Village. If you child would like to enter please draw an A4 poster with them that would be suitable for encouraging safe driving/walking around the site. The posters will be given to the developers who will choose winners and turn the winning entries in to posters to be used along Greene Street. The speed bumps have been adjusted in height though the signage is still missing - we will keep you updated about this. we have been told that the speed bumps are a temporary, though long term, measure to reduce the speed of contractors through the site. You should have all received an email from the FOTF about the Christmas Fayre on Thursday 3rd December - if you didn't please get in touch with the School Office to check we have your correct email address recorded. The email included details of the Dress Down Day on Friday 27th November so please check this out to see what your child's class has been asked to contribute to the Fayre. Nativities - details of the role your child will play and any costume needed will be sent home next week in your child's book bag. An email will be sent out about tickets etc early next week. Sign-up: available from Monday morning - sheets will be at LilyPad and then the school office - sign up can only be done along with £5 in named envelope. The £5 covers food, craft etc; staff give their time on a voluntary basis. Children can bring along their pyjamas to change in to so they'll be ready for bed when you get home. The stay and play is open to all year groups, including Nursery. Our caterers, Edwards and Ward, are sponsoring a competition next week for your child to win cinema tickets - we'll let you know about any winners we have in school. Over the last two weeks both Reception class and Year one have been out for a wet and windy Autumnal walk to our local woods Shepherds Copse. The abundance of rain had left us with a multitude of muddy puddles, big and small, squelchy and squishy, all were perfect for splashing in. We also found a few animals tracks left in the mud, we identified deer, dog and people prints, although we weren’t quite so sure about the ones that looked like dinosaurs, bears and Gruffalos. We made our way around the farmers field where the long grass was swishing in the wind and found some great spots to play hide and seek from the teachers at the back. On arriving at the woods the children noticed how few of the trees had leaves on and the rainbow carpet of leaves that covered the woodland floor. We explored the woodland to find as many different colours and textures we could to make our own autumn colour palettes on stick cards. We then used our detective skills and tools to see what creatures we could find in the woods, there were many woodlice, snails, slugs, centipedes, millipedes, spiders, a lacewing and even a few ladybirds. We then used clay and natural materials to make our own super spikey hedgehogs, we talked about hibernation and then made some cosy homes for them from sticks and leaves. After a game or two of countdown hide and seek to warm up, we ventured back through the swishy grass and squelchy puddles back to the warmth of our cosy school. What a wonderfully windy and wet few weeks! Apologies for lack of photos this week - for some reason Google Chrome and Blogger did not get on well today! Hello everyone and a warm welcome back to term 2 at Tadpole Farm. It is always a lovely term to be part of a school community and we have many exciting events planned. If your child is off school please phone school on 01793 729740 or email school@tadpolefarmcepa.co.uk by 9:00 on day of absence and then keep us informed each day that they continue to be off school. As you know, we are not allowed to authorise absence for holidays in term time except in exceptional circumstances. If you do intend taking holiday during term time please come and discuss with us before booking and write an email or letter to the Chair of the Local Board to ask for permission. The Local Board will consider all requests, applying the guidelines outlines in our absence policy. If you choose to take your child out of school anyway the absence will be unauthorised. Whether an absence is authorised or not, we are happy to provide additional reading books for your child to continue to practise their reading skills but will not provide other learning resources as we prefer to support your child's learning in school. FOTF are working away on preparing for the Christmas Fayre and will soon be contacting you about volunteering opportunities to support this. They would like as many of you as possible to find exciting raffle prizes by asking any contacts you have to make generous donations for our raffle. Those of you who came to our big band night before last July will remember the great band we had that night - Opanda. They have offered to do another event for us on Thursday the 10th December. FOTF will be providing refreshments, entry is free but we ask you to sign up on sheets in the school office, so we can keep a check on numbers, and will be collecting voluntary donations on the night to be split between the band (they don't know this as they aren't expecting anything but we thought it would be a nice thank you to them) and the FOTF. It is likely that the event will run from the end of school until 6:00pm, so any children attending might want to bring things to change in to - this has yet to be confirmed so watch out for more news re timings. Just a reminder that the FOTF Facebook page is for comments and news linked to fundraising only. If your child has mislaid a PE bag or sweatshirt etc please let the school staff know so that it can be resolved - thank you. The weather has been rainy and is getting colder. Some children are coming in to school without coats still and we ask that you can ensure they have a warm coat, hat and wellies in school as we like to get outside in all weathers. Please make sure these are named. Talking of named items, could you please check that your child only has sweatshirts/cardigans with their name in them as we've had a few go missing - thank you. The children are now happy and confident coming in and we would ask that, for YR/Y1, you say goodbye to them outside and allow them to hang up their things and come in independently - thank you. Lots of YN children are beginning to do this too but please liaise with Mrs Smith if you have any queries. Working with the Wiltshire Wildlife Trust we have arranged some Wild Walks (currently Autumn but will also be events in winter and spring) for the children - dates to be confirmed but YR will be going on Monday and Tuesday next week - notes came home today and were emailed too so please check you know what they need to bring in. We have full sets of waterproofs for them so they don't need those. Next week the children will be learning about Diwali and having a whole school celebration on Friday; Friday is also Children in Need day. We have decided that for Children in Need, if the children want to come in in clothes other than their school uniform, they can the dress in the colours of Diwali - red, green, yellow and orange - we realise this may make bottom halves tricky so they may wear jeans on their bottom half and these colours on the top half. If they come in their own clothes they should bring a donation for Children in Need - we suggest 50p or £1. On Monday 16th November, 5:00 - 6:00 pm, in the school hall, we are holding a phonics workshop for YR parents and their YR children. The children will be helping to show you how they learn their phonic sounds so if you could just bring your YR child that would enable you to spend some time with them looking at the different ways they learn. Sign up sheets will be in the School Office. The demand for LilyPad places continues to grow which is lovely. If your child normally attends Lily Pad after school and you decide not to use your place as a one-off, please let the School Office or class teachers know so that the place may be used by others. The children, who are going to LilyPad, are collected from the classrooms before the other children go to the door for parent pick-up time. We do this so that they aren't waiting around whilst other children are picked up by their parents. If you haven't let us know that your child is not attending LilyPad when they usually do, we will have to ask you to go to the LilyPad doors to collect your child. Thank you to all those who have given us feedback on speed bumps and the state of the roads and pavements. I got in touch with Crest Nicholson last night; they sent one of their project managers out today, who confirmed that the speed bumps, which should be 75 mm in height only where, in places, higher than that. The contractors will be returning on Monday to rectify this. Crest Nicholson took on board our earlier complaints about some of the contractors speeding past the school and so are enforcing a 5 mph speed limit through the construction parts of the site - the speed bumps are part of this and additional signage will also be installed. These measures will help the safety of your children. They are looking in to how to clean the roads and pavements more effectively and I'll keep you informed about this when I hear more information. The message below is directly from Crest. You will be aware that speed humps have now been installed at Tadpole Garden Village to enforce the 5mph site speed limit. 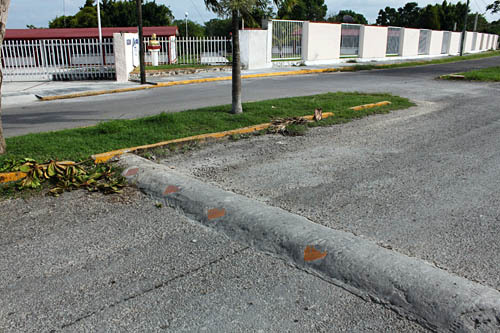 Whilst this enforcement has been achieved, we are aware of issues with the profile of the humps, with some being installed higher than specified, meaning that they are very uncomfortable to ride over. We are investigating the problem with the Contractor for a swift resolution. In the meantime, please remind all drivers on site to take care when travelling within the Tadpole Garden Village Site. I will notify you when the issue has been resolved, but would be grateful if you could disseminate this information to all those coming to site over the next week. We have a number of vacancies in school to cover increases in numbers and changes in staff organisation - currently the vacancies are for a Playleader; a clerk to the Local Board - for these two roles please log on to www.eteach.com and search for Tadpole Farm CE Primary Academy, closing date is 16th November - and a Kitchen Assistant - please let the school office know that you may be interested and they will give you the details of Edward and Ward, our caterers.